It’s time for another round of peanut butter reviews. Two of these jars are thanks to the Peanut Butter of the Month Club, the other two jars were purchased out of my own curiosity and never-ending quest for the ultimate peanut butter. I’ve mostly moved away from flavored peanut butter – I enjoy the textures and flavors of plain peanut butter as a result of different processes such as roasting levels, peanut variety and amounts of salt. Each brand has their own unqiue process, and similar to wine tasting, I like to distinguish them. For this round of peanut butter tasting I present a few lesser known brands and varieties, one in particular that is unlike anything I’ve had before. The first jar from the club has been reviewed here before but this time around I’ve got a whole jar to contend with. If I had to choose amongst the assortment of peanut butter flavors out there, cinnamon raisin is my favorite but despite trying many commercial versions, I still prefer homemade. The commercial varieties tend to be overly sweet, especially the Peanut Better brand. It’s still a great peanut butter and a spoonful makes for a great dessert. My favorite use for this is in a Linda Delite or Peanut Butter Hot Dog. The bottom line: make your own. This peanut butter uses palm oil in place of hydrogenated oils to achieve a no stir, shelf stable product and is one of the best products to do so. Similar to Skippy or Jif this peanut butter has added salt and sugar, the difference is that Maranatha uses all organic ingredients and also tastes more like actual peanuts. The chunks are crunchy and the peanut butter between the chunks is creamy but is a bit pastey and reminds me too much of Skippy, although I think that’s the point. At first, the pale color was a turn off but it doesn’t seem to affect the flavor. I enjoy natural peanut butter better, but this is perfect for those who miss their Skippy. First of all I love the label on this one, it’s crooked, wrinkled and gives a certain home-made feel to the peanut butter. And as I expected, this peanut butter is fantastic, it’s unlike anything I’ve ever had. The grind is coarse which makes for a gritty texture that I really enjoy. Somehow the peanut butter still manages to be fairly runny and easy to mix despite the oil separation. The most unique aspect is the texture of the chunks. Now there aren’t really chunks in this peanut butter but it is a very coarse grind – the closest thing I can compare it to is wet cement. Each of those little chunks are so crunchy that I’m waiting for a response from the company to find out what makes it so crunchy and different. On top of that, the flavor is different than normal peanut butter, a little earthier. My guess is that they use a different variety of peanut to make this peanut butter, one that is generally considered an “eating peanut”. Since they sell “extra crunchy” peanuts on their website I’m almost convinced those are the ones sacrificed for this glorious peanut butter. By the way, if you’ve never had “extra crunchy” peanuts before, you’re missing out. 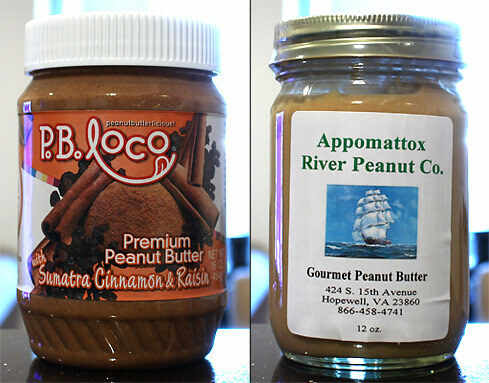 This is what the PB of the month club is all about – gourmet, small batch, local peanut butter that you would otherwise never experience. At one time (and possibly still) this was a rare find in stores. 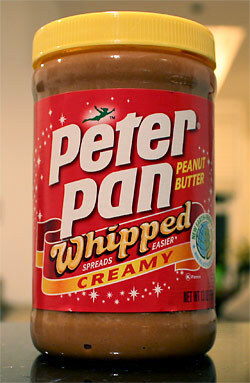 From what I can tell, it’s the same as regular Peter Pan only whipped. The flavor is nutty and a little salty but what won me over is the texture. It’s very airy as you would expect but as a result, it’s not as dense or as sticky. Similar to Bazzini Creamy, it has the consistency of a light and fluffy cake frosting, only moreso. It’s actually dangerous because it is very easy to eat straight from the jar. It’s not all natural, which I tend to go for, but the texture is like nothing I’ve ever had. On the plus side, it is very easy to spread and contains less calories since it is about 20% air. On the downside, once you spread it the airyness mostly disappears although it’s probably still a little thinner than normal. For such a unique product at only $1.88 a jar, you really can’t beat it. I like the look of that Appomottax one, too. I imagine it’d be hard to find, and yet those seem to be the best ones. It’s too bad that it’s so difficult to find. Luckily I can order online but that comes with the usual downfalls – overall price. Apparently I can’t contact them by email either, I need to call. I’m going to see if they will sell me a 10lb jug! the sumatra cinn was my fav pb&co flavor, but i agree–i’d make it before buying it again. i’m not as much a fan of the added oils, but the texture they get are pretty amazing! It’s true, they do add to the texture. I’ve wondered about buying some of the oil and experimenting with it, but there might be more of a process than simply mixing it in. The thing that gets me with flavored peanut butter is that it’s so expensive! All you need is 2T sugar, 1T cinnamon and a handful of raisins to flavor an entire jar! It works out to less than $2 a jar if you use TJ or Whole Foods brand of PB. I WOULD LOVE to try the Appomattox Creamy. You make it sounds amazing, and I don’t think I’ve ever had “Extra Crunchy” peanuts before which is just so wrong. I need them in my life! My friend loves freezing that Whipped Peter Pan. Then she scrapes off spoonfuls to use as smoothie toppings. She said it’s the only PB that freezes well. I hope Santa is listening, it’s the most wonderful gift! Appomattox is now one of my favorites. It’s definitely got a unique flavor but the crunchiness is unbeatable, especially considering it’s basically “creamy”. I’m not sure where you can find extra crunchy peanuts but look for them…you won’t be sorry! Freezing the Whipped Peter Pan? I love the idea, I’ll throw a jar in the freezer when I get home, thanks for the tip! i wish in msia, there were more varieties. the only ones here are Skippy and Jif.. and if one is willing to splurge, melrose nut butters. Me either, hence my frustration at liking them! Ignorance is bliss! a PB from VA! gotta try since I’m from there. Glad it got a rave review. yes, crooked labels are so authentic! When you go to VA, bring me back a 20-lb tub! $1.76 a jar too so Santa can be frugal! I really do keep meaning to make my own nut butters. And now that I have access to a food processor, it should be a breeze! I love the idea of cinnamon raisin, too.